Its an interesting question but one that isn’t very easy to answer. The word “Textile” would suggest that fabrics or thread were to be used in the making and the word “Artist” would imply that everything that was created was made by applying the usual art elements of line, texture, shape, colour, pattern and form. According to Wikipedia, a Textile Artist is someone who “uses plant, animal, or synthetic fibers to construct practical or decorative objects”. Occasionally I post on international facebook groups and was once asked to remove a post because it was seen as craft not art. It was a picture of a finished lampshade. Ok, it was a functional object, but I had spent several days constructing and stitching the actual piece of fabric- looking at colour, shape, space, pattern, repetition, line, etc- in exactly the same way a “proper” artist would design from scratch. My art is my craft, my craft is my art- where do you draw the line? I know of several true textile artists who struggle to get their work accepted in the art world. When I left teaching a few years ago, I was reluctant to call myself a Textile Artist. I felt I was a bit of a fraud- I didn’t have the exams or years of experience I had as a teacher. There was no one course I could take, which would qualify me in my new role. So I researched what was meant by the title ” Textile Artist” and I came up with my own desirable list. Here it is…. 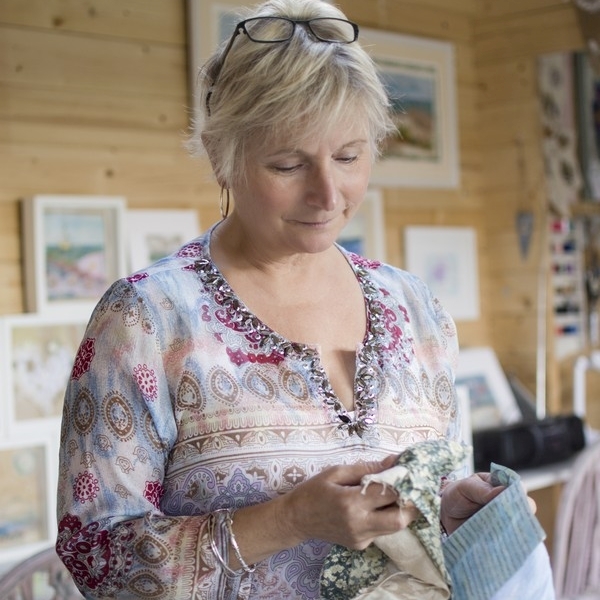 I know I’m a Textile artist when I……. Of course this list was made when I was just exploring this new world of being self employed so several of those points would apply to any new business. As time has gone on, my goals have changed slightly and will continue to change. I used to sell my work but now focus purely on the workshops so being part of a designer guild and exhibiting are not as important as they once seemed. I never thought in a million years that I would have my own studio, I can’t believe how important that space has become for me- I welcome people into it every week and hope that they enjoy the atmosphere that I have tried to create. Someone walked in last week and said- “It’s so lovely in here- all clean and crisp and fresh, just like a lettuce!”. We both collapsed in giggles, so now I can safely say my workshops can be counted as one of your 5 a day! To date I’ve managed to tick most of the boxes so I’m happy to be where I am now. I have no doubt that my list will continue to change as I progress on my journey. Its become much more of a techie journey than I ever imagined but that’s a reflection of the world we live in now isn’t it? All the more reason to escape to a wonderful day of becoming fully absorbed in a day of stitching. Nothing else matters when you’ve got your head down and the creative juices are flowing.